Gorzycki Middle School Traffic Procedures-Click for more information. · Morning car traffic at the circle drive will be reduced to two lanes as you approach the drop off zone. We ask that you please pull forward as far as you can before letting your child exit the vehicle. A staff member will be on duty to prompt you to pull forward. · Children exiting vehicles in the outside lane (farthest from the building) need to make their way to the left hand curb and approach the crosswalk where an adult will usher them safely across the driveway. · If you have business inside the school, you may park in the designated spaces in the front parking lot and enter the school by way of the crosswalk. Parking in the circle drive and/or leaving your vehicle unattended is not permitted. 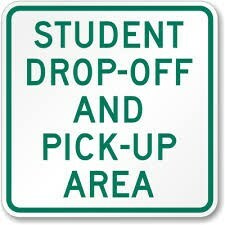 · Due to safety concerns, cars are not permitted to drop students off in the back of the school. This area is designated for buses and staff only. · Three lanes are designated for afternoon pick up. It is recommended that vehicles needing to make a right turn on to Slaughter cue up in the inside lane (closest to the building) while vehicles needing to turn left on Slaughter cue up in the outside lane. The middle lane is appropriate for either. · Leaving your vehicle unattended is not permitted. Children and pets need to remain in the vehicle with the parent. · Students need to exit the building promptly as the first wave of vehicles will be dismissed at 3:47. If you do not have your child at the dismissal signal you will need to pull forward and circle back around to the end of the line. · Please do not change lanes in the pick up zone unless directed to do so by a staff member. Changing lanes has a tendency to create chaos and is not safe. · Vehicles will be dismissed by lanes (one lane at a time). All three lanes will be emptied and refilled before allowing the next wave of students to load. Students are not permitted to leave the curb until signaled to do so by an administrator. PARENTS PLEASE BE ADVISED: In an effort to ensure the safety of the Gorzycki Community, we have met with APD to discuss concerns that have been raised regarding parents parking/standing on Slaughter to pick up students. This is a very dangerous practice. It is also illegal. APD has asked us to remind parents of the importance of practicing safe habits on the road and to notify parents that APD will be stepping up patrols and addressing safety violations on Slaughter over the next few weeks. Your cooperation with following road rules will help us to maintain a safe environment for our students and reduce risk of parents getting traffic citations.